Do all Zygopetalums look like this? It seems like they all look like this. Though usually they're less blurry. Not much to report lately; I'm heavily preoccupied with trying to dump imidacloprid into all the plants. 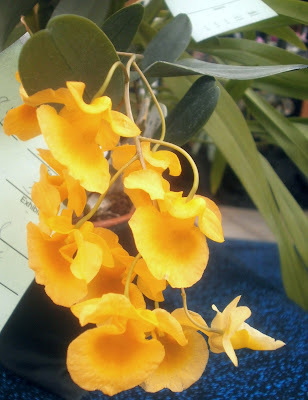 It isn't particularly difficult to do: it just makes watering take longer, so there's less time for anything else. And of course I'm still finding scale as I go, though less of it than I expected. 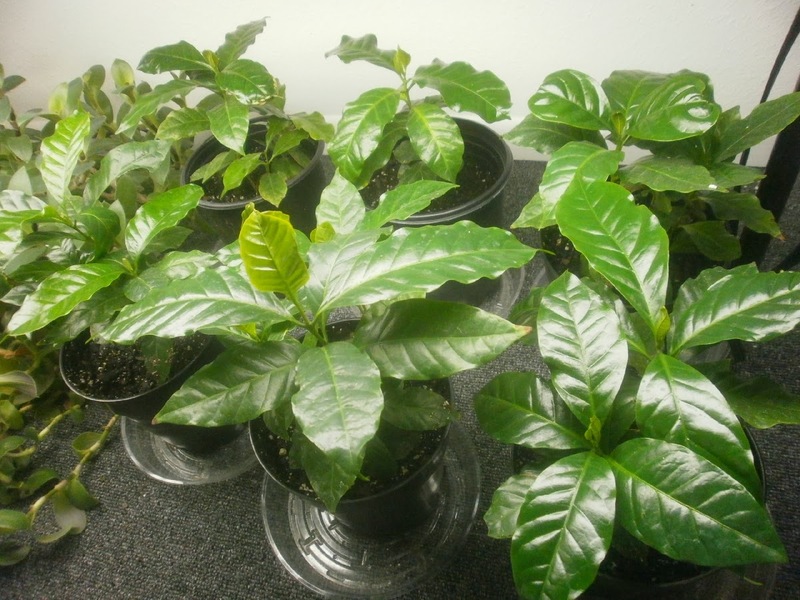 Of the eight pots of Coffea seedlings I started back in February, I still have six. (The other two got sold at a consignment store in Iowa City.) I up-potted them to 6-inch/15 cm pots a couple weeks ago, because they were drying out before their turn in the watering cycle came around. I've been surprised at how quickly they've grown: I once believed that the plants we got in at the ex-job, about this tall, in 4-inch pots, were probably about a year old, but it seems more likely now that they were only six months. If even that. The cornfield behind the house got harvested yesterday.1 Sheba sometimes worries when the machinery shows up to do things to the field (understandable: it's a large, blurry object making growling noises in the back of the house where she plays: I'd be alarmed too), but she either didn't notice it this time or she's getting used to it. This is slightly sad for me; I like when the field is planted in corn better than I like when it's planted in soybeans. 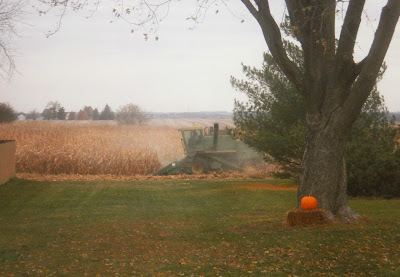 Since we've lived here, they've alternated plantings, so next year will probably be a soy year. As expected, the Neoregelia 'Gazpacho' has continued to bloom. Less expected is the fuzzy white fungus that appears to be growing on the spent flowers. 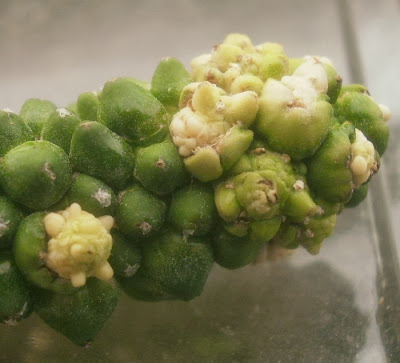 I can't recall seeing this before, and my ongoing battle with fungus on the Euphorbias has me worrying more about this than I otherwise would, even though I doubt it's the same fungus. Aside from that, though, the Neoregelia is behaving normally. It already has two good-sized offsets on it. This is a lot faster than I was expecting. 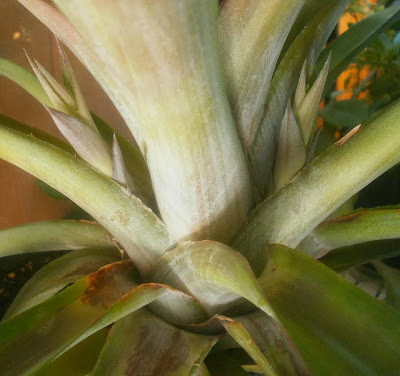 The fruit is still on the plant and everything, though the reduced light indoors has made it lose a lot of its color. Pretty sure all the true flowers have opened and closed already. 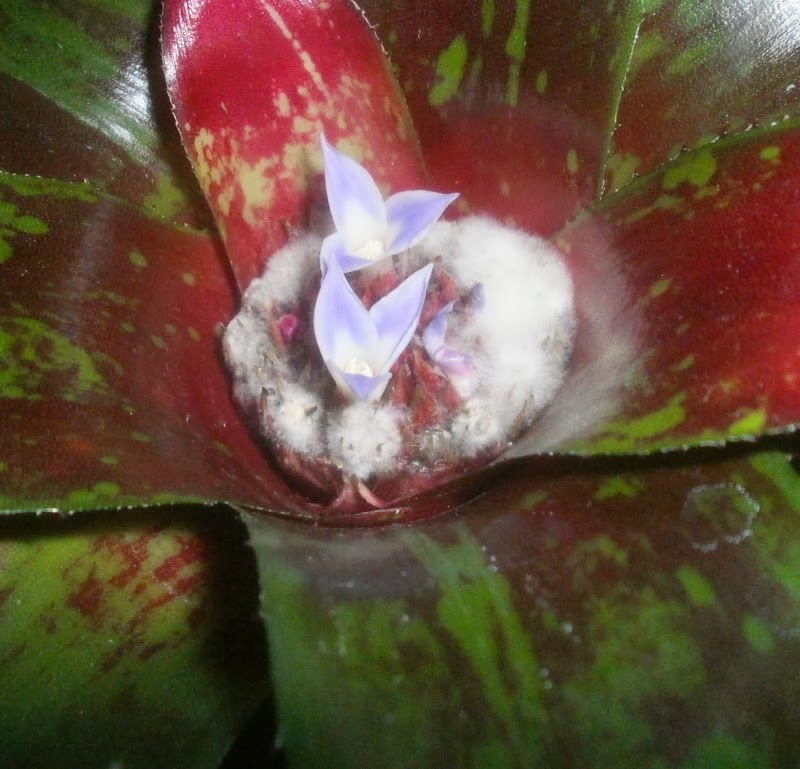 Finally, one of my older Spathiphyllums (I got it in January 2007) has self-pollinated a number of times, and has produced a couple hundred seeds, but the seeds have so far mostly fallen to fungus, instead of germinating. I had been hopeful that this spadix, which appeared to have been pollinated successfully, and which seemed to be developing normally, might provide another chance, but instead it started to get these white cauliflower-like bumps, and then I accidentally broke it off its stem while I was trying to get it ready for photos, so I never got to see the cauliflowers develop into whatever they were going to develop into. This may be a good thing, depending on why the atypical growth was happening, but I was a little bummed all the same. There is one exciting thing to report on the whole Spathiphyllum-breeding project, though: my biggest peace lily (likely 'Mauna Loa' or 'Sensation'2), which I've had since January 2003, is blooming right now, after a long bloomless period. The spathe hasn't opened yet, and I don't know for sure if it will be interfertile with my other plants when it does, but I've wanted to propagate it for years now. In almost 11 years, it has never offset, so the only way I'm going to propagate it appears to be by seed. I'm keeping my fingers crossed. 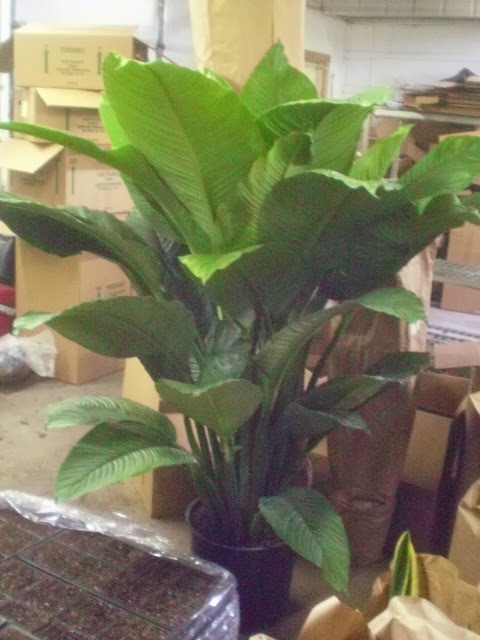 2 I'm guessing those cultivar names on the grounds that they're the main varieties of Spathiphyllum that I'm aware of which get really big. 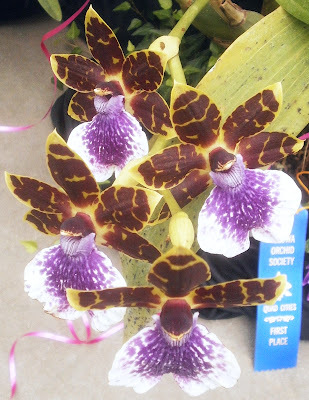 'Mauna Loa' is one of the oldest and most popular of the big varieties, and 'Sensation' is the largest variety the growers' guide could come up with that's at all common -- supposedly 'Sensation' can reach 5 feet (1.5 m). Mine's not anywhere near 5 feet tall, but it's been indoors for 11 years, so some stunting would be understandable. Even under my non-ideal conditions, the leaves are all a solid 13-19 inches (33-48 cm) long, and it's vastly bigger than my other spaths. Who was maybe 5 or 6 feet (1.5-1.8 m), and sold to us as 'Sensation.' Even if not the world's largest Spathiphyllum, I wouldn't want to run into it in a darkened alley or anything. Not considering some of the things I've said about spaths in the past. Granted, that's a double-edged sword, since Google also likes to torment me by correcting things that I've typed incorrectly on purpose, or correcting things that aren't even wrong, just less common than whatever it thinks I should be looking for. But even so. It's getting smarter. Not the greatest picture, alas. So it goes.